Gold prices have been rising sharply, breaching the $1,000 barrier and in recent weeks rising towards $1,200 an ounce and above. Today’s “gold bugs" argue that the price could top $2,000. But the recent price surge looks suspiciously like a bubble, with the increase only partly justified by economic fundamentals. Gold prices rise sharply only in two situations: When inflation is high and rising, gold becomes a hedge against inflation; and when there is a risk of a near-depression and investors fear for the security of their bank deposits, gold becomes a safe haven. The second price spike occurred when Lehman Brothers collapsed, leaving investors scared about the safety of their financial assets—including bank deposits. That scare was contained when the Group of Seven nations committed to increase guarantees of bank deposits and to backstop the financial system. With panic subsiding towards the end of 2008, gold prices resumed their downward movement. By that time, with the global economy spinning into near-depression, commercial and industrial gold use and even luxury demand took a further dive. Gold rose above $1,000 again in February-March, when it looked like most of the financial system in the US and Europe might be near insolvency, and that many governments could not guarantee deposits and backstop the financial system, because banks that were too big to fail were also too big to be saved. That panic subsided—and gold prices started to drift down again—after US banks were subjected to “stress tests", the US Troubled Asset Relief Program further backstopped the financial system by removing bad assets from banks’ balance sheets, and the global economy gradually bottomed out. There are several reasons gold prices are rising, but they suggest a gradual rise with significant risks of a downward correction rather than a rapid rise towards $2,000, as today’s gold bugs claim. First, while we are still in a world of global deflation, large, monetized fiscal deficits are fuelling concerns over medium-term inflation. Second, a massive wave of liquidity, via easy monetary policy, is chasing assets, including commodities, which may eventually stoke inflation further. Third, dollar-funded carry trades are pushing the dollar sharply down, and there is an inverse relation between the value of the dollar and the dollar price of commodities: The lower the dollar, the higher the dollar price of oil, energy and other commodities—including gold. Fourth, the global supply of gold—both existing and newly produced—is limited, and demand is rising faster than it can be met. Some of this demand is coming from central banks, such as those of India, China, and South Korea. And some of it is coming from private investors, who are using gold as a hedge against what remain low probability “tail" risks (high inflation and another near-depression caused by a double-dip recession). Indeed, investors increasingly want to hedge against such risks early on. Given the inelastic supply of gold, even a small shift in the portfolios of central banks and private investors towards gold increases its price significantly. Finally, sovereign risk is rising— consider the troubles faced by investors in Dubai, Greece and other emerging markets and advanced economies. This has revived concerns that governments may be unable to backstop a too-big-to-save financial system. But, since gold has no intrinsic value, there are significant risks of a downward correction. Eventually, central banks will need to exit quantitative easing and zero-interest rates, putting downward pressure on risky assets, including commodities. Or the global recovery may turn out to be fragile and anaemic, leading to a rise in bearish sentiment on commodities—and in bullishness about the dollar. Another downside risk is that the dollar-funded carry trade may unravel, crashing the global asset bubble that it, together with the wave of monetary liquidity, has caused. And, since the carry trade and the wave of liquidity are causing a global asset bubble, some of gold’s recent rise is also bubble-driven, with herding behaviour and “momentum trading" by investors pushing gold higher and higher. But all bubbles eventually burst. The bigger the bubble, the greater the collapse. 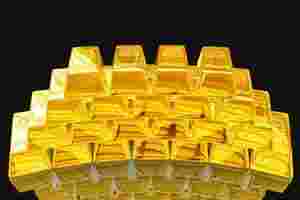 The recent rise in gold prices is only partially justified by fundamentals. Nor is it clear why investors should stock up on gold if the global economy dips into recession again and concerns about a near-depression and rampant deflation rise sharply. If you truly fear a global economic meltdown, you should stock up on guns, canned food and other commodities that you can actually use in your log cabin.